When we build applications for our clients, we always strive for client self-sufficiency. Self-sufficient clients get more out of their applications, have more engaged users, and tend to “do more” with the application, so it’s a worthy goal for all concerned. You’ll want to determine the right amount of self-sufficiency for your organization. There are many factors to consider, but what it generally comes down to, is resource availability. Every application has certain ongoing support needs, you’ll want to make sure these are covered one way or another—either with your own staff (preferable), or with some outside help as needed. The following checklist is a good place to start for evaluating your current level of self-sufficiency. Note that we have defined business-side and IT-side roles as a starting point—these are, of course, flexible depending on how your organization is structured, but we generally do recommend a balance of business and IT professionals to help manage your application. 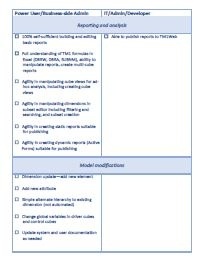 Note: This checklist focuses on applications built based on IBM Planning Analytics/TM1. We recommend that all clients strive to be at Level 1 as soon as possible. When we, at QueBIT, do an implementation with you, we will schedule the necessary training and knowledge acquisition sessions to ensure that you are self-sufficient at Level 1 at the end of the first phase of your project. This is a good place to start your internal evaluation of your skillset. If you feel you have some gaps at this level, we recommend contacting us, and we can set up some ad-hoc training to help you fill in any gaps. If you feel the items listed here are currently beyond your team’s reach, or you just don’t have the time or resources to dedicate to these tasks, we recommend you look into a managed services solution to ensure your application and your users are properly supported. To check out QueBIT’s managed services offerings, click here! For many clients, Application Owner is the right level of self-sufficiency. But, if you have the necessary resources, level up! It’s important to note that while many of the Level 1 tasks can be owned by a technical-minded business professional, from here on out, involvement from IT becomes more critical, as the items increase in technicality. An understanding of system architecture in general also becomes more important at this level. Beyond Level 2, it’s best to rely on a professional developer. 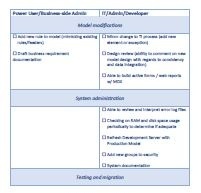 Some larger firms have the resources to have internal developers, but for most, relying on a third-party for the following items is recommended. For some context: our professional developers go through months (not days) of intensive training, and have a wide variety of experience across application types, client sizes, and industries. Replicating this experience is generally out of reach for internal client staff, unless they are dedicated application developers. Getting the design right is worth engaging an application architect to ensure it’s done correctly. If you have some budding designers in your organization, then look to engage us for architecture review to make sure your new model components get off on the right foot. Performance testing requires detailed knowledge of how TM1 works—without understanding the intricacies of how things like Web Reports, Rules and Turbo Integrator processes impact performance, the testing will not be effective. We have developed testing tools to facilitate a robust testing of your application. This is a great opportunity to team up with your IT support, to ensure that the system is architected appropriately for your organization, and that your solution is maximizing data integration opportunities. Setting up TM1’s CAM security requires some specialized knowledge of both TM1 and BI. Lean on us for coding standards! We’ve built hundreds of models, across many types of organizations, so there’s no guesswork involved here, our standards are based on real-world scenarios, not just on textbook learning. This may be a Level 2 task, if you have team members with strong installation skills, but we recommend a buddy-system approach to transition this activity internally.